Twice in the past month I have had the chance to head to Five Mile Recreation area in the west desert. The first trip was with Mike, we will cover it in our upcoming podcast. The second was with my brother in law who was visiting from Idaho. Five Mile Pass is located about 25 Miles west of Lehi. Head west on Lehi Main Street for about 30 minutes and you are there. You will pass through Cedar Fort and Fairfield and the staging area is just off the highway on your right you can't miss it. It is one of the best places to ride ATVS in Utah year round because it gets very little snow in the winter. Five Mile is an awesome place to ride with thousands of trails across the mountains. 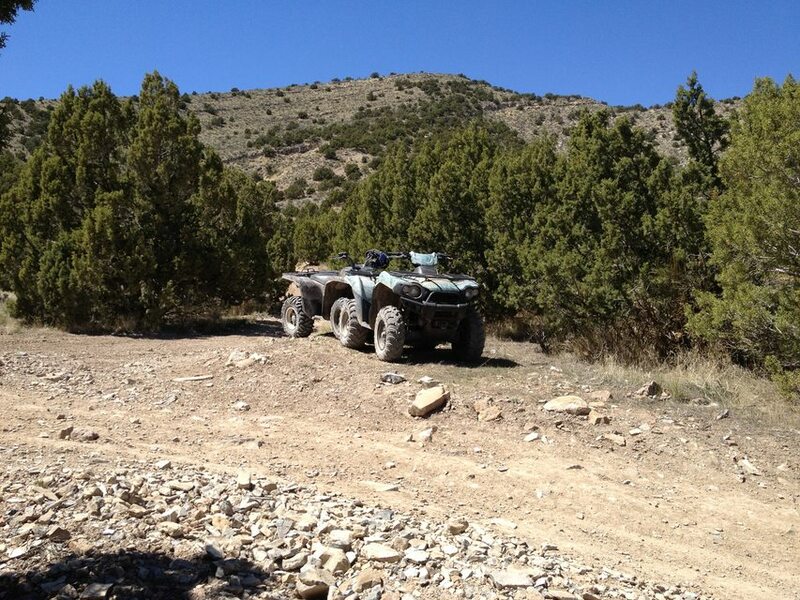 Five Mile is a great place for any type of OHV and any skill of rider. The staging area is a great place to introduce beginners to trail riding without too difficult of trails. 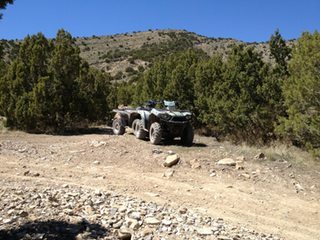 When I went with Mike we took the Sport Quads which was a ton of fun but a few of the trails were too steep so I decided to come back with the Brute Force and Grizzly The Big Bore Quads also made for a more comfortable ride across the very rocky terrain. Don’t let this scare you away if you are an experienced rider, there are miles and miles of steep, rocky difficult trails that can keep you busy for days. In Fact we rode most of the day both times and rarely hit the same trails. I believe we could go back a few more times before any of it became overly familiar. Pulling up to Five Mile can be a bit worrisome on a nice weekend with tons of rigs in the staging area. I could not believe how many people were already there when we arrived around 9:30. I was pleasantly surprised by the lack of other riders we came across. With thousands of break off trails leading over and around mountains and hills we almost never ran into other riders. Our Ride was really great we started off by heading across the highway to the south side of Five Mile Recreation area. I was hoping to find a really awesome ravine that Mike and I had ridden a few weeks earlier. After trying about twenty amazing trails I gave up and headed west towards the flats. There is an awesome dirt road that leads past some fields with grazing cows that is straight smooth and really long. It’s a perfect place to run some time trials and possibly a drag race or two. We enjoyed going full throttle across this area and took a small break on the opposite side next to the remains of an old stone home or barn. I wanted to loop as far south as we could on the way back around the primary mountains and then head north on the other side of the Highway. Finding our way around was a bit difficult but led us to some really great trails including a ravine we rode in for several hundred yards. One thing I love about 5 Mile is there are so many options, for example when traversing one mountain we had 4 options which route to take I sadly chose the wrong one. It looked amazing and ran right along the edge of the mountain with a cliff on one side. It was a bit scary but looked okay until just after we rounded the last place we could see the trail turned into a motorcycle trail too narrow for a ATV. The problem was it left little room to turn around, luckily we found a decent spot and with spotting each other we were able to flip around and head back. The North side of 5 Mile is just as great as the south side. We drove north for around an hour climbing some pretty steep rocky hills before we needed to head back because we were running low on fuel. From what I saw trails lead north for a long ways to a much bigger mountain area that I would love to explore. Overall we had an awesome trip and I can’t wait to get back out there and try it out. I recently purchased a GoPro camera and have taken it on the last two trips but sadly the footage is not great. I set the angle wrong on this trip so most of the riding is looking down to much to be interesting. I am still sorting the footage and hope to have at least a few clips to share in the upcoming podcast. Have you ever been to Five Mile Pass Recreation area? What did you like? What did you hate? Tell us in the comments section. Also sign up with our site and get updated each time we make a new post. For now Ride Safe Ride Hard Ride Often. 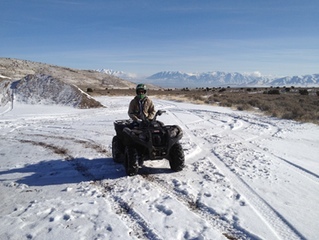 The ATV Cowboys headed to Little Moab on Presidents day and had a blast. Just like last years Video Cast we wanted to take advantage of some winter riding without having to deal with tons of snow so Little Moab was the perfect choice. 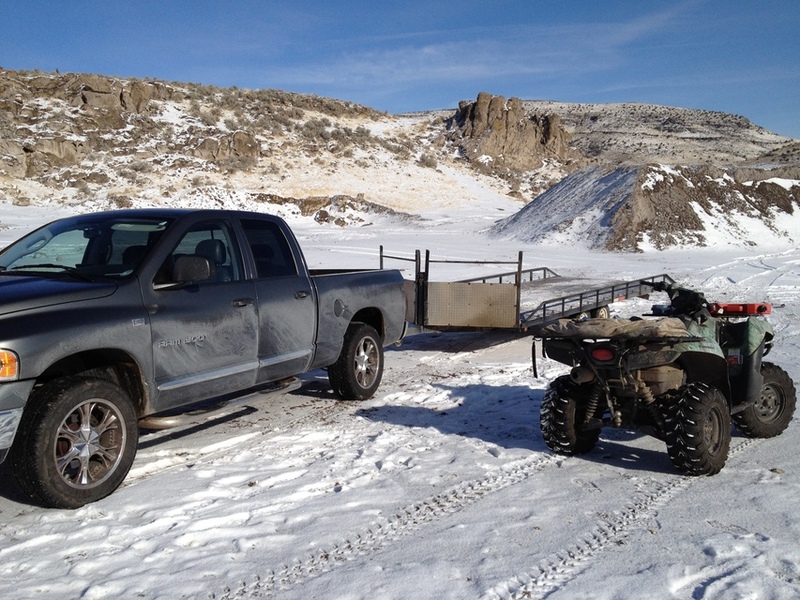 My brother in-law Mike... yes another Mike in the family and I took the Grizzly and the Brute Force out for some winter fun. It snowed Sunday evening leaving us with around two to six inches of snow to play with which really added to the trip. The snow was the perfect amount to make the steep dirt trails a bigger Challenge to climb. In several of the narrow canyon trails the increased depth of snow made forging through the powder a blast as we flew down trails and slid around corners. We spent a large part of the day exploring a few trails I had never gone down that went for miles, most of which ended in dead ends leaving us with some fun maneuvering to get turned around to head back. Several of the trails are being cut and added to so it was fun to travel across some areas that are not complete trails, One of the ravines had a nasty little rock section that is not only fun but once it has been fully developed I believe will connect to the primary trail leading to mount Baldy. I had to take Mike over to the actual Little Moab rock formations where we spotted each other and used the ATVs narrow wheel base to our advantage and climbed a few rock sections that would be difficult for a Jeep or Crawler. However most of the course is not suited for ATVs because of their short and narrow wheelbase. Be sure to use a spotter so you do not end up ruining a trip with a rolled quad. Never been to Little Moab? You should check it out directions here. What is your favorite thing about Little Moab? Please sound off in the comments section! Over the next few weeks and months you will start to see some changes here at atvcowboy.com. This news is good as the primary changes will be focused on new content. So what can you expect? Lots of new content, as we talk about trails, rides, repairs, gear, and of course ATVs. Content will come in all kinds of mediums like Video Casts, written posts, guest posts, photographs and reviews. We are doing everything we can do bring relative, informative and exciting content to you. Some changes will be made to enhance user experience of the site and to update the way some of the back end of the site works. If you love the site please share it with friends and family. So winter blues have you down? Get a laugh or a cringe out of these ATV riders. Yamaha Raptor 700R. Sadly I won’t be getting it but I have great memories of getting ATVs Christmas. The Honda Foreman 400: I was 13 years old and mom and dad got us the Foreman for Christmas. It changed everything, we did. Now we had four-wheel drive and suspension, not to mention almost double the power. The Foreman became our snow cat hauling insanely large numbers of people to the top of the mountain for sledding and snowboarding. Often we had two people on the front racks, two on the seat and three on the back racks and one pulling behind on a rope. Getting out of second gear was tough and I can’t imagine the years of life we sucked out of the Foreman those winters, year after year doing the same thing. The Foreman in our minds could do anything. With a set of aggressive atv tires and some momentum I would push through several feet of snow, with clouds of snow flying over the front handle bars. Often biting off way more than the ATV could handle I would find myself waist deep in snow shoveling a way out. During the other seasons we rode the Foreman every single day. Some of our favorite activities included forging the river and driving through the natural spring bog in the river bottoms. The foreman was light compared to it’s competition which enabled us to get it unstuck easier than our friends quads, so Mike and I often were the first to try a new spot out. All of this riding took it’s toll on the Foreman, multiple roll overs and smashed suspension which left the plastics rubbing against the tires have mangled the foreman over the years. Before we upgraded to a sport quad the Foreman was our jumping vehicle as well. Honda should have sent a film crew to see the things we put the Foreman through over the years. It would sell anyone on it’s dependability. Rarely has a quad been ridden so often and so aggressively. Best of all the mangled quad still sits in my garage. Its duties have been reduced to yard work and running Molly our Labrador down the dirt road next to our house and back. The Foreman still starts with no problems and is a blast to ride. Thousands of memories were born that cold Christmas morning. The EX. I do not believe we are total Honda Homers but how could we go any other direction after what we have done with the Foreman. Not to mention the 400EX opened a door to 4stroke sport quads that will never be closed. Sam already had and EX and for two years Mike and I brought up getting an EX about every-time we talked to Dad, now that I am older I can only imagine how annoying that must have been for him. Dad loved surprises and we really had no clue we would be getting the EX for Christmas. I still remember Christmas eve when dad brought it home he did not want any of us to see it so he dropped it off at a neighbors picked me up to run an errand, the quad was in their drive way and cunningly he told me to look the other way at something as we passed. Doing the same thing on the way back he basically hid the EX in plain sight. Christmas morning was great as usual and after we had opened all of the gifts we snuck a peak outside to see if there was anything in the front yard... nothing. Dad told us to come back and that their was one more gift on the fireplace mantel. Disappointed knowing we would not be getting one this year Mike and I stared searching the mantel. There it was small black and perfect we found a key hidden in a Santa's sleigh. We dashed for the door, dad yelled that it was in grandmas garage who lived next door. We ran into her garage and there it was bright yellow and beautiful. Of course we fought over who drive it first and who would spend the next day or so driving the break in miles, and showing it off to Sam who lived just down the road. Once again everything we knew about riding ATVs changed, we could go faster, jump higher and control our machine just that much better. The Dunes became our friend and one of our favorite places to ride and the next thing you know we needed another sport quad to keep up with the EX. The yellow plastic is fading to a light orange color now and with several upgrades the quad looks quite different from the one we found in grandmas garage. However almost 9 years later I still love to ride it and it by far gets driven the most out of our machines. I am not sure when we will be getting an ATV for Christmas but I know it will be a memory I will never forget. If getting an ATV is something you have been considering for your children I will be the first to recommend it, scrap getting a few of those wimpy toys at the kiosk in the mall and start saving for an ATV, it’s a gift your family will remember forever. What experiences have you had with ATVs and Christmas? If you have a story you would like to share email it to me at jared.doldham@gmail.com and I will post it on the site or you can just leave it in the comments section.